In Photoshop CC, you can paint in 32-bit color — with some caveats. The Brush, Pencil, and Mixer Brush tools (but not Color Replacement) are available. The Blur, Sharpen, Smudge, and Eraser tools are also available in 32-bit color, but not Dodge, Burn, Sponge, Background Eraser, or Magic Eraser. Type layers, shapes, and paths are also at your command. You can add color to a 32-bit image with the Gradient tool, but not the Paint Bucket. And although the History Brush is available, the Art History Brush is not. The Content-Aware Move, Patch, Healing Brush, Spot Healing Brush, and the Red Eye tool are disabled. 32-bit images can have multiple layers and layer styles, too. Be aware, too, that not all blending modes are available in 32-bit color. Normal, Darken, Multiply, Lighten, Difference, and about a dozen less commonly used blending modes are enabled for tools and layers. Working with painting tools and gradients requires a way to define color in 32-bits. When you open the Color Picker while working with a 32-bit image, you’ll see something different. 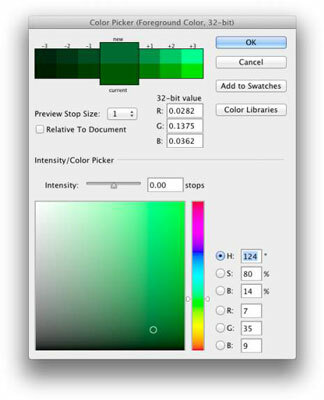 In this figure, the 32-bit Color Picker shows some additional features. In addition to working with HSB and RGB fields, color is defined with the Intensity slider. Think of “intensity” as “exposure.” It permits color values that go beyond RGB’s 255/255/255. Define the color and choose how light or dark the exposure is — it’s sort of a fourth dimension of color definition. The bar at the top shows the last-selected color below and the current selection above. You can click on any of the six previews to the left or the six to the right to jump to that color. You control how different each of the 12 previews is from the current color with Preview Stop Size.